← Free book: Did Jesus Rise From the Dead? The judgment upon Edom is mentioned prominently in chapter 34 (verses 5, 6, 9; cf. the city of Bozrah, v. 6). The most prominent place today within the ancient territory of Edom is Petra. 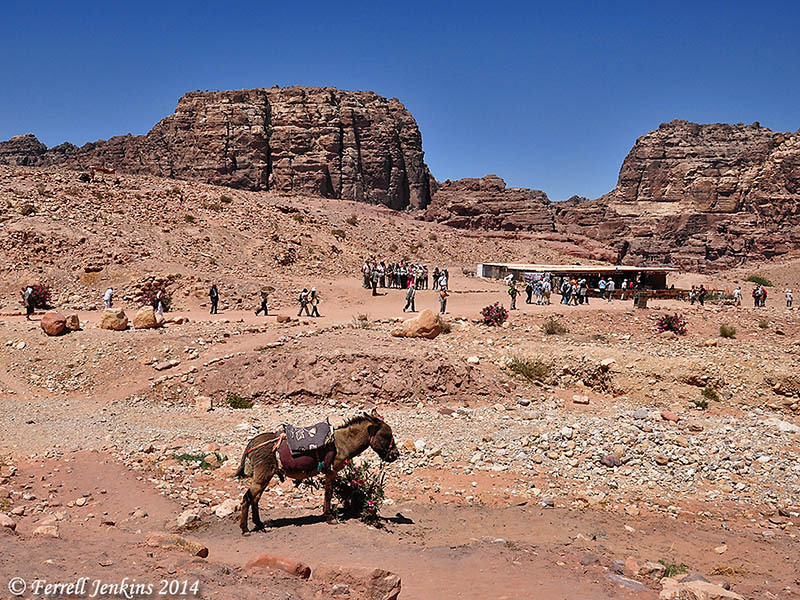 Most people visit Petra to see the sculpted structures of the Nabateans. But the Nabateans came much later. The area was originally settled by the descendants of Esau, the brother of Jacob (Israel). 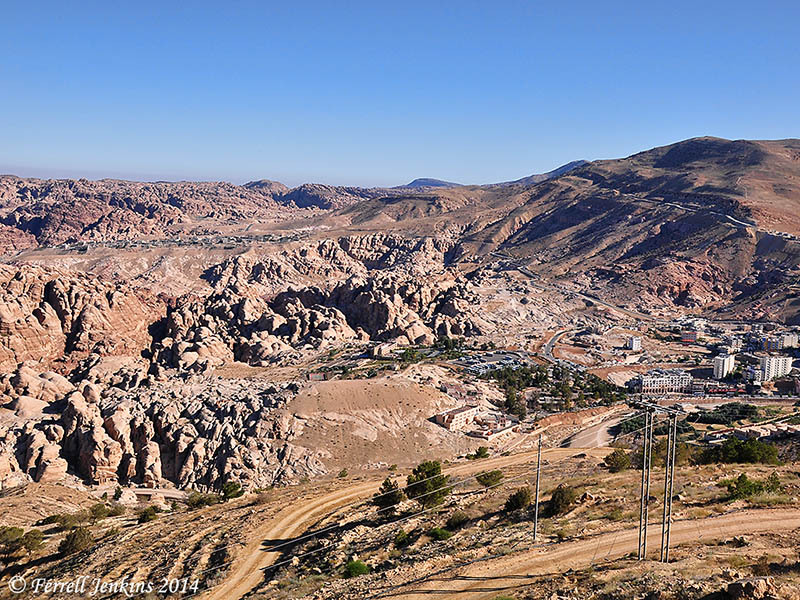 Our first photo, showing the desolate nature of the area, was made from a higher spot where several tourist hotels are located. To the right of center you will be able to see the parking lot and some of the buildings associated with the operation of the national park of Petra. Petra is located within this ancient territory of Edom. Photo by Ferrell Jenkins. Our next photo was made inside Petra, but our attention is drawn to the large, high, steep-sided, flattop mountain named Umm el-Biyarah. From this vantage the ancient Edomites felt impregnable. Umm el-Biyarah, the ancient stronghold of Esau. Photo by Ferrell Jenkins. For those who wish to see a more comprehensive discussion about Edom, I call your attention to the succinct discussion by J. Alec Motyer in the Tyndale Old Testament Commentaries. Edom is presented as a case in point. Even though Esau himself had no capacity for sustained animosity (Gen. 33:4–16), it was with him that relations with Jacob were soured (Gen. 27:41) and by the time of Numbers 20:14–21 hostility had become an established pattern. Saul made war on Edom (1 Sam. 14:47). David became the only king to subdue and annex Edom (2 Sam. 8:14; cf. 1 Kgs 11:15–16). Edom rebelled against Solomon (1 Kgs 11:1–17, 23–25) and was still rebelling a century later (2 Kgs 8:20). Fifty years further on, there was still fighting (2 Kgs 14:7, 10), and at the fall of Jerusalem the bitter hostility of Edom became notorious (Ps. 137:7; Obad. 10–14). Consequently Amos’ accusation (1:11) of perpetual hatred is well founded. Jeremiah 49:7–22 shows that, even prior to Edom’s behaviour at Jerusalem’s fall, the idea of judgment on Edom was part of the prophetic worldview. Obadiah saw Edom as both a place and a symbol: meriting judgment in its own right but also picturing the judgment which would mark the Day of the Lord. He was not innovating: in Psalms 60:8; 83:6, Edom had already a symbolic place in the theme of hostility to Zion. Two factors make Edom specially fit to stand as a motif for the whole world in the final judgment: first, its ceaseless hostility to the Lord’s people, and secondly the fact that it was only to David that it ever really succumbed. Thus Ezekiel, foreseeing the coming David (34:23), moves immediately to the conquest of Edom (35:1–15). Isaiah stands in this same tradition by following his forecast of the King (ch. 33) with the rout of Edom in the final judgment (cf. 11:14; 63:1–6). Recollecting 29:22 and the establishing of the family of Jacob, the overthrow of Edom/Esau makes the End the exact fulfilment of the beginning (Gen. 25:23). The purposes of God according to election stand. This entry was posted in Bible Lands, Bible Places, Bible Study, Israel, Jordan, Old Testament, Photography, Travel and tagged Edom, Isaiah, Petra. Bookmark the permalink.